Each new phpList release includes new features and improvements, documented in release notes and shared on social media. Help spread the word by writing about them and sharing within your own community. 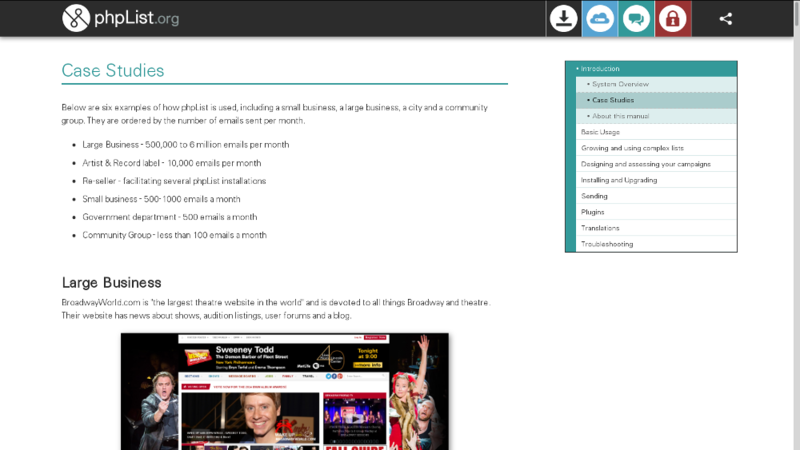 The new phpList manual has case studies which show off some great uses of phpList. 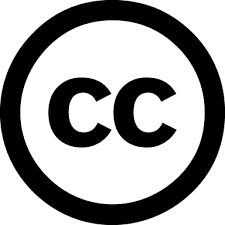 As part of our ongoing commitment to Open Standards and the Document Freedom Day campaign, our manual is available in .odf, .pdf and epub, as well as online (in xhtml). 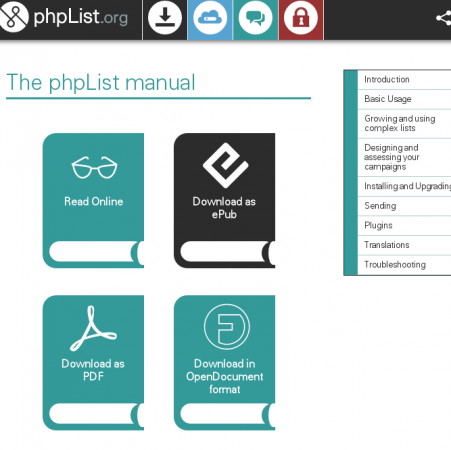 The phpList manual is published under a creative commons (CC) licence: this means that you, and other users, can edit and share the manual as much as you like, so long as you maintain the CC licence. On phpList.org you can see some amazing statistics. Here is how we get the data. There is a blog about it here. Here are some images you can share on social media. 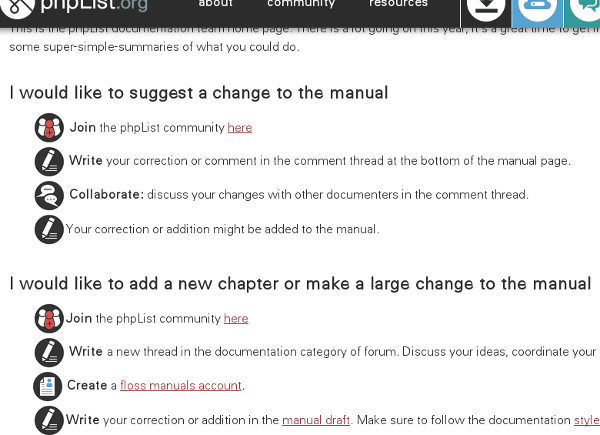 phpList.org will use feedback loops, for example polls, to help the community understand itself. The first one is pretty simple, but in the future we can look at the diversity of our community, everything from type of organisation to gender. phpList.org has lots of call to action areas: these will help people understand what kind of tasks they can do, as part of the community. 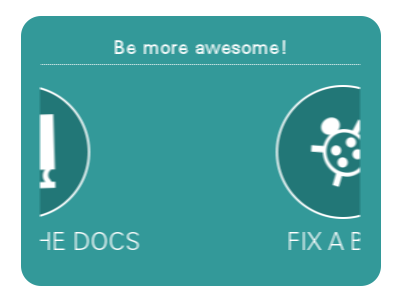 Tasks include fixing a bug, helping someone and donating. As this site develops, we will tailor the call’s to suit the community member using the site: for example if they are in the documentation team, they will see more actions related to documentation. 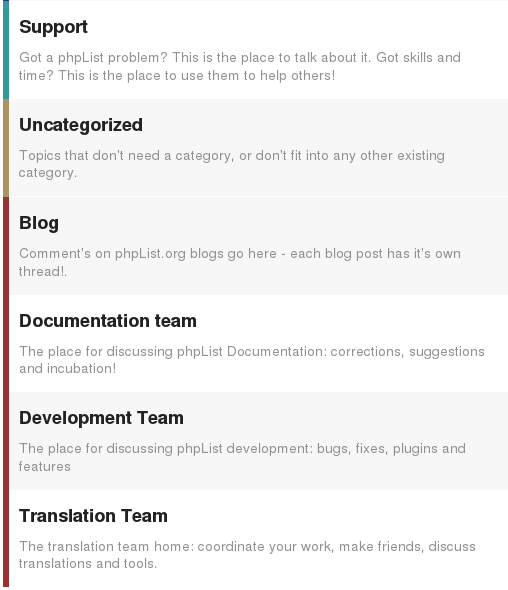 phpList.org uses discourse forums: the discourse style lets us just be in one team, view one category, or be everywhere at once, view all categories. This conversational, fast paced forum with a fairly flat structure should help us work together as a whole community. It’s going to be a real breath of fresh air! 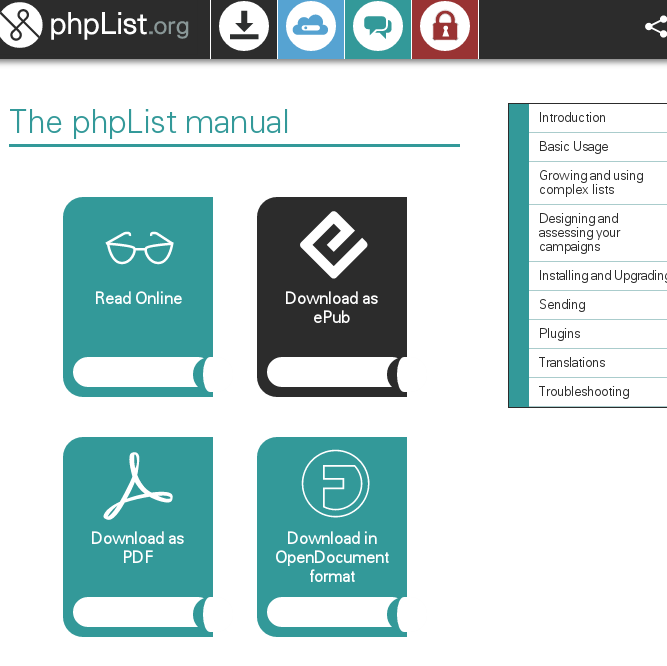 phpList.org has simply documented processes, a bullet-point list of how to achieve your goals and get stuck in with the phpList community.